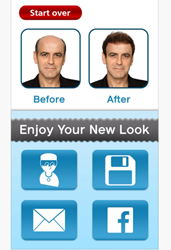 Dr. Parsa Mohebi, founder of US Hair Restoration, goes into detail about the newest innovative IOS application “Hair Now”. The application has been in development for over a year in order to ensure that it provided enough options to benefit users with different hair loss classifications. There are upcoming plans to integrate even more customization into the application so that male and female patients experiencing hair loss can easily enhance their image, communicate their goals with their doctor, or simply share their before and after images with friends and family through social media. Additional features for networking are forthcoming, as well as the ability to select from more hair samples. Applications like Hair Now represent only the beginning of what’s possible with today’s diagnostic technology. This application was designed to help patients who expressed discomfort with the idea of attending a hair loss consultation, to feel more positive after viewing before and after pictures of themselves and of real patients who have already had a procedure done. This easily accessible application allows users to visualize the benefits of hair transplants before undergoing a hair restoration procedure. US Hair Restoration was established in 2008 by Dr. Parsa Mohebi. As creator of the several methods and techniques in modern hair restoration, Dr. Mohebi and his staff provide the most advanced techniques in hair restoration. Dr. Parsa Mohebi proudly provides services in the Beverly Hills, Encino, and Orange County hair restoration centers in order to better serve all patients. The overall goal at US Hair Restoration is to restore patient’s self-esteem through the use of quality hair restoration.